It all started out so simply. It’s summer. Limes are eight for a dollar. 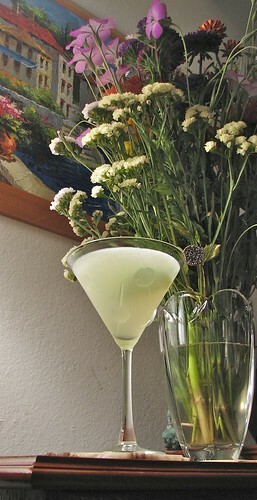 I like gimlets (especially gin, though vodka ones can slake the thrist in a pinch). So no problem. Make a gimlet, but use fresh lime juice and a splash of simple syrup. Only problem? A gimlet, by definition in at least a half dozen of my cocktail books, requires Roses bottled lime juice cordial. It’s true, Rose’s lime does impart a distinctive taste that can’t be replicated with fresh lime juice. So that settles it. I did NOT make a gimlet. The thing is, I actually think that gimlets (even at 3:1 or 4:1 gin-to-Rose’s), it’s simply too sweet. What’s funny is that some gimlet recipes suggest adding simple syrup to the Rose’s lime and gin. Oh well, not for me. So that leaves us only one question. What exactly did I make? Scrubbed my cocktail books and found very little. It’s basically a gin daiquiri. Also, it’s basically a gin rickey, but without the club soda, which would change the nature of the cocktail. We’ll definitely revisit the gin rickey before the summer is out, though. I found two references in Gary Regan’s the Joy of Mixology. The first was a Delicious Cocktail, which was lime juice, simple syrup and gin. This cocktail had a bunch of mint as an aromatic garnish and the ratios weren’t quite what I had used either. The other cocktail was the Bennett cocktail, which is gin, fresh lime juice and simple syrup (a 4:2:1 ratio), plus Angostura bitters. Well, I didn’t use the bitters, but other than that, it seems a good fit. This is a nicely potent summer-ish cocktail. The Joy of Mixology suggests Angostura bitters, which I think would make this cocktail and even tastier potation. CocktailDB.com recommends two dashes of orange bitters. That seems an even better idea. B and I were batting around the cocktail and actually thought Fee Brothers new Grapefruit Bitters might be an even better thought. We’ll have to give the bitters a try and report back. I would also like to make an actual gimlet (haven’t had one recently) and compare it to this tippling. Roses lime juice is the definitive source of lime for a gimlet (which certainly are tasty), but with limes at 8 for a dollar at pedrick, I am always looking for ways to add fresh lime. The lemon verbena intrigues me. I am thinking I could add it to some highly refreshing seltzer based cocktail where you wanted a lot of lemon, but without as much of the citrus juice. Definitely going to put some thought into this.